We haven’t posted an update on the APU Roadmap front for a long time so I thought it was time to do one. This year AMD will be taking a leaf out Intel’s book and bringing about the ‘Kaveri Refresh’ platform. On the mobility side of things Carrizo and Carrizo-L will be landing in BGA Packaging but we also have some rather interesting news on that front. Carrizo APU with 4 Excavator Cores. Full HSA 1.0 Support and upto 35W TDP for the top end model. The packaging will be FP4 BGA. The SoC will be fabricated on the 28nm node. Carrizo-L APU with 4 Puma+ Cores. Full HSA 1.0 Support and upto 25W TDP for the top end model. The packaging will be FP4 BGA. The SoC will be fabricated on the 28nm node. On the Ultra Low Power side we have Mullins APU Refresh platform with upto 4 Puma cores. SDP will be 2W and packaging will be FT3 BGA. The SoC will be fabricated on the 28nm node. Finally on the desktop side we will have Kaveri Refresh platform. There are confirmed reports of yet unreleased SKUs releasing throughout 2015 but I cannot confirm whether the flagship A10-7850K will be getting a refresh with higher clocks etc. In all probability the flagship is staying as it is with only lower powered models or re-iterations releasing throughout the year. These will be fabricated on the 28nm node. The first 20nm APUs ‘Amur’ and ‘Nolan‘ are expected by Q3 2015 and will be targeted at the tablet market. Now the juicy part. Well, the reliable Expreview.com has recently published confirmation that Carrizo APU will indeed be coming to the desktop side of things. But before you rejoice, listen to the catch; the packaging will stay BGA so it will only come to desktop in the form of welded motherboards. However this obviously means that once you are done with the processor you will have to throw out the motherboard as well. The reason we are getting this is because OEMs are aware of the demand for desktop APUs. The same report also states that AMD will be updating the GCN architecture so that Carrizo APU will have support for Hardware DirectX 12 (feature level 12_0) which is good news. Carrizo will apparently be using a modified 28nm SHP process that results in low power consumption but also is unfeasible for the higher performance desktop applications. It will be one of the first APUs to feature an integrated Southbridge chip (becoming an SoC and also why it will be incompatible with the FM2+ socket regardless of any OEM modifications). 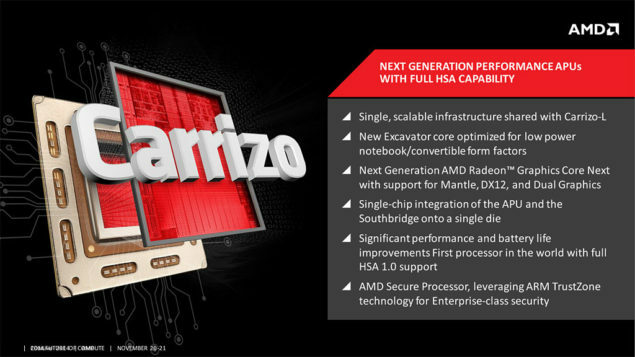 It seems that AMD will be focusing on breaking the mobility market with an HSA fueled processor capable of playing modern games at reasonable settings without draining the battery like a dGPU. The company had also previously revealed that it will be focusing on making money this year, so I assume cutting the insane costs associated with taping out (high performance) dies is the reason for decision.